The Wonder Cooker from the famous Chef Tony is a fast, healthy, and versatile cooker that lets you cook, grill, steam, fry, and roast. It is powerful and comes with an adjustable heat control that lets you cook up to 30% quicker than ordinary pots and pans. The secret is the Wonder Cooker’s dual action cooking that combines contact heat with a high domed convection lid to turbocharge cooking time. It also comes with the Stack and Steam Rack, which gives you two levels of cooking. By being able to cook two dishes at once, you’ll save even more time. With the Wonder Cooker, you don’t have to use cooking oil unless you’re frying. This means less trans fat and healthier meals for you and your family. 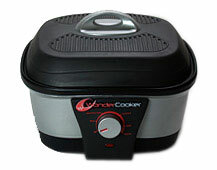 The Wonder Cooker comes in a versatile, lightweight, and compact design for easy storage. Plus it is dishwasher safe for easy cleaning. The Wonder Cooker also includes the Stack and Steam Rack, a Muffin Pan, and Recipe Cards. Order now and you’ll also receive 6 Fondue Forks, Chef Tony’s 30-minute recipe cookbook, and a Flowering Onion Guide free. You can order the Wonder Cooker for just 2 easy payments of $39.95 plus shipping and handling or 1 easy payment of $79.90 plus shipping and handling. 6 Comments on "Wonder Cooker"
hello i would like to purchase the wonder copker and i love on mombasa kenya. please let me knoe if you have a branch hete or how i can get it on kenya. thank you. I am from South Africa and looking for the Wonder Cooker, please can you tell me where i can find one. I see a few people have enquired about where to buy the wonderchef – can you please let me know as well?